Buona Sera Tables Out of Line? RED BANK - An advocate for the disabled has complained to the borough about a Maple Avenue restaurant's sidewalk dining arrangement, saying that the dining area obstructs pedestrian access and is in violation of federal Americans with Disabilities Act requirements. 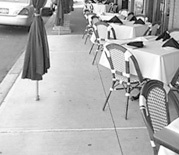 In April, the borough council approved outdoor dining for Buona Sera restaurant on Maple Avenue, despite the objections of two council members and one resident who raised concerns at that time about blocking the public access to the sidewalk. Last week, Carolyn Schwebel, executive director of a disabled advocacy group known as the Equalizers, said she has contacted the borough administrator about the sidewalk obstruction, which she said could very possibly lead to a federal lawsuit if it is not corrected. Schwebel's organization successfully participated in a prior suit against the borough for ADA violations in public buildings. Schwebel said her husband went to the restaurant and night club at 50 Maple Avenue, which wraps around Maple to Monmouth Street, and measured the Maple Avenue area where the tables are located to see if it meets the requirements set by the federal Americans with Disabilities Act. "It's not even 'close, kind of,'" Schwebel said about the table placements and the available space for those seeking to pass along the sidewalk. Under the American with Disabilities Act (ADA), there should be a minimum of three feet of unobstructed walkway to allow pedestrians, including the disabled who may need the assistance of a wheelchair or crutches, to pass. When the measurements were taken recently, Schwebel said, at some points there was as little as 28 inches. "And that is with the tables pushed up against the wall," she said. Compounding the problem on the Maple Avenue restaurant frontage, are the awning poles planted into the sidewalk's cement and the large planters by curbside, Schwebel noted. "It's all very scenic," she said, "but it does get in the way." At the April 27 meeting, the borough council voted 4-2 to renew the restaurant's application for outdoor dining. The previous year there was a similar debate about the number of tables that should be allowed on that stretch of sidewalk along Maple Avenue, which is State Highway 35, a heavily traveled thoroughfare. The proposed two areas of four tables had one council member, Kathleen Horgan, say, "I think it is too much, personally," and with Councilwoman Sharon Lee, the other dissenting vote, saying, "I'd like to see three tables." Mayor Pasquale Menna this week said he has not been in contact with Schwebel or reviewed her information, which, according to Menna, includes video of the restaurant on some evenings, but, "I don't disbelieve her." Along with Schwebel's concerns, Menna said, "I've heard from some other people who also have some challenges, not malcontents, but those who have some really legitimate issues." "We may have to pull the permit on those tables," and insist that the restaurant and nightspot use the smaller café style tables intended for two people, Menna said. Schwebel has yet to hear back from administrator Stanley Sickels, who did not return calls for this story. And while she hopes it can be rectified, if it isn't, "I may have to go back to the DOJ [the United States Department of Justice]." "I know if we send it to the DOJ they will find them in violation," though, Schwebel acknowledged, it would take quite some time. "It will be resolved," Menna insisted. "The last thing we want to do is not comply with ADA." Schwebel described the Equalizers as a national loose-knit organization that advocates for the rights of the disabled, especially as it relates to compliance with ADA, the 1990 federal act that required accommodations be made for the disabled in public areas. Most recently, according to Schwebel, the Equalizers reached a significant settlement with the owners of Pier Village, a residential and retail development on the Long Branch oceanfront. In 2000, the group filed a complaint with the federal Department of Justice alleging Red Bank failed to meet the ADA requirements for its public buildings including the then recently constructed municipal complex, 90 Monmouth Street, and the public library, 84 West Front Street. According to Natalie Sinicrope, a DOJ investigator for the department's Disability Rights Section, the borough and the department reached a settlement in October 2002, agreeing to make seven borough-owned facilities more handicap accessible, as well as providing other accommodations. Christopher Mariani, the restaurant's owner, did not return a phone call by press time Wednesday afternoon.